While watching “Many Rivers to Cross” this week, an episode full of stories of resistance, escape and fighting back, this is the family story that came to mind. 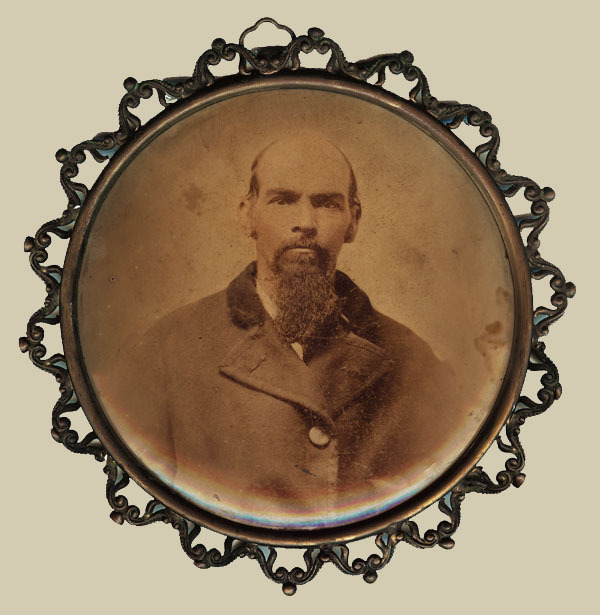 Dock Allen – tintype with frame attached. It had been a wet spring, that 1861 in Dallas County, Alabama. Dock Allen was 21 years old and already a good carpenter. He was a white man’s son, but the man who now held him in slavery was not his father. His owner was known as a cruel man who kept vicious dogs to instill fear in his slaves. He wanted them to be afraid to run. When Dock made up his mind to escape, he had a plan to throw the dogs off of his track. There was a swampy area where wild ramps grew. He rubbed himself with them, poured the water on himself and rolled around in the field so the strong onion odor would hide his own human smell. He had been running and running. He was bone tired. He could hear the dogs tracking him in the distance when he came to a small farm near Carlowville. He couldn’t go any further. He climbed up into the hay loft, covered himself with hay and lay there barely breathing. The dogs came into the hay room. He could feel their breath as they walked over him, but they didn’t smell him because of the ramps. Eventually they left. This was the same place where Eliza and her small daughter Mary, lived. Eliza had been freed several years before. She lived on the farm of Nancy Morgan. Did Eliza hear the dogs and see Dock stumble into the yard? Did she silently direct him to the hide in the hay? Later Dock decided to give himself up. Nancy sent a message to his master. It wasn’t long before he came to the house. He said that no one had ever out smarted his dogs and that any man who was smart enough to do that deserved to be free and he freed Dock. Dock stayed on that place and he and Eliza married. They stayed together until he died in 1909. He was 69. Doc Allen in the record. Dock and Eliza (Williams) Allen’s grave. I found Dock Allen in in the 1867 voter registration database living in Montgomery, AL. 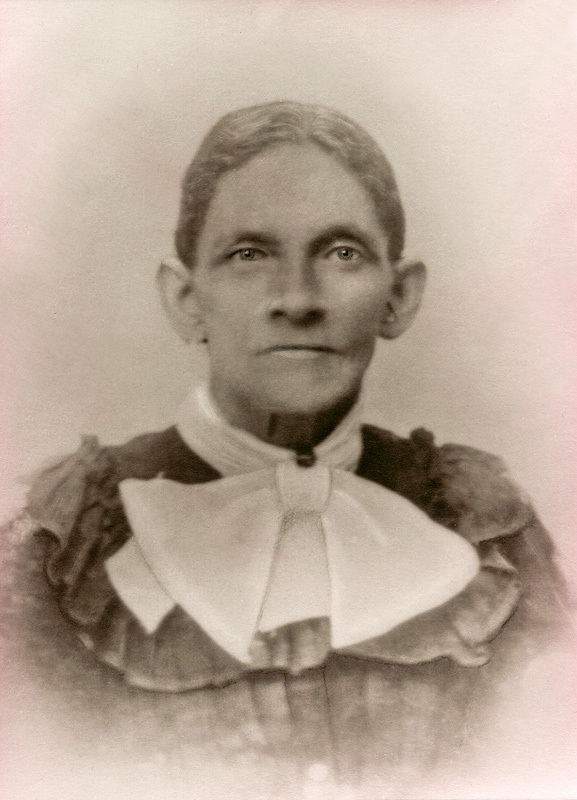 He appears with his family in the 1870, 1880 and 1900 census in Montgomery. According to the records he was a carpenter born in Georgia. He owned his own home. In the 1900 census he and Eliza had been married 40 years which puts the beginning around 1860. I have three addresses for him, 237 Clay street, 216 Holt street and finally 444 S. Ripley street where he lived for the five years before he died March 29, 1909 of “inflammatory bowels” after being ill for several weeks. His mother is named as Matilda Brewster on his death certificate. No father is listed. 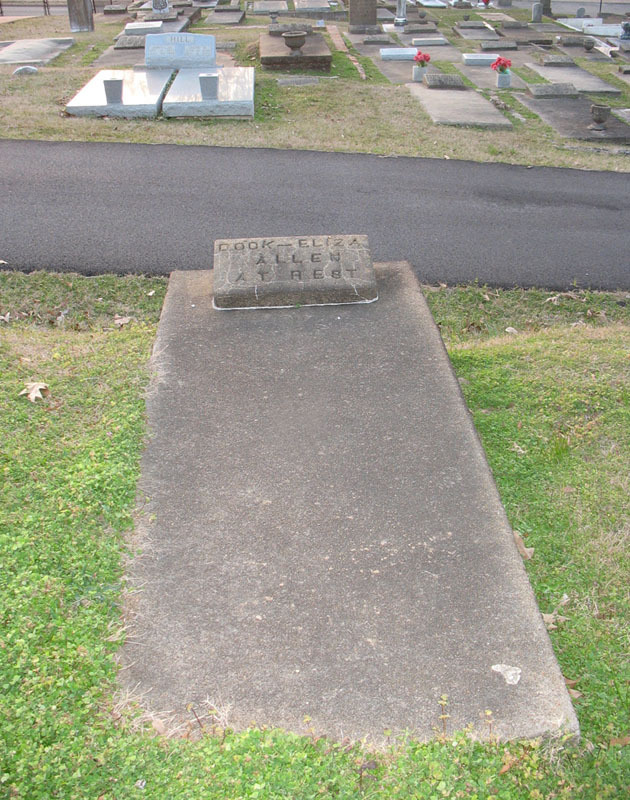 He is buried in Oakwood Cemetery in Montgomery. I don’t know if this is exactly how Dock Allan escaped from slavery. This is the oral history that we have. I never knew this story until my cousin Jacqui Vincent and I made contact years ago. Dock and Eliza (Williams) Allen were my 2X Great grandparents. I’ve written more about Eliza’s story in these posts. Pleased to know Dock had a plan and it worked, and his master recognized his intelligence by rewarding him his freedom. Wonder if he was afraid he would make a plan to kill him in his bed if he brought him back. I love how Oral History works.’Keep the truth alive & letting people know who the Real Heroes were. Bless Dock & Eliza. Me too Tony. And I’m glad my family talked so much so we know at least some of those stories. What a great story! Thank goodness the bravery and ingenuity of your Dock Allen was passed on in family stories. The thought of being savaged by those dogs is horrifying, but he overcame the fear, outwitted them, and lived to become your 2X great-grandfather. Wonderful to contemplate. And the unknowns are intriguing too. Whether, as you wonder, Eliza helped save him from the dogs; this story even makes me wonder if he had already somehow met Eliza earlier and she had partly motivated and guided his escape. I haven’t yet watched the series, Many Rivers to Cross (one of my favorite songs by Jimmy Cliff). but now I will. reading your stories is so inspiring because every time they remind me anew how it is we, the people, who make history. I am more inclined to believe the story than not. Brave men and women ran to freedom doing things like that. Loved the story and love the name. That was such a brutal time and yet love stories like Dock an Eliza somehow found a way. I wonder why Dock initially decided to give himself up? Their story could be a novel! That is the part I wonder about too. Seems like there is more to that part than we’ve remembered. Okay Kristin, I have to tell you that this “city-slicker” had to look up what wild ramps were. Based on the context clues I gleaned from your story, I thought they were some type of garlic plant only. But I thought I better go see to be sure. Low and behold, the photo I saw was what I’ve always called little green onions –LOL! I had no clue to all the names this plant was called — leeks, ramps, ramsey, ramsh, ramsies, ramsy, rommy, and roms. I tell you I learn something new from all my genea-blogging friends everyday . . . I love it! WOW! How Dock Allen earned his freedom is an awesome story, and you’re very lucky to at least have this oral history to go on. All of my family research to date has been more on names than stories. The story of Dock Allen is indeed a wonderful addition to the Many Rivers to Cross series we’re enjoying at this time!